The bridge over the Rosslyn canal on the parade route to Rosslyn's Arlington National Cemetery features ornamental structures with empty cartouches. 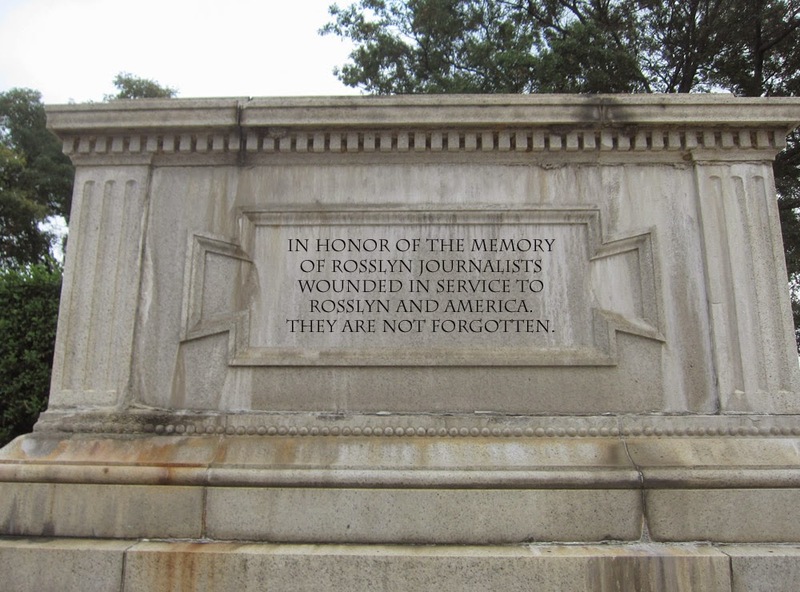 The Ode Street Tribune proposes that one of the cartouches be engraved in honor of Rosslyn journalists wounded in service to Rosslyn and America. While such an engraving unquestionably would be profoundly appropriate, the Tribune encourages all Rosslyn residents to make proposals for engravings to honor the service and sacrifices of Rosslyn residents to the greater good. I suggest that the plaque commemorate Rosslyn as the birthplace of positive, constructive and informative online journalism. The type of journalism that was initiated by the Ode Street Tribune. With the fantastic success of the Ode Street Tribune others are sure to follow and to make this the predominant type of online journalism. Excellent suggestion. The Tribune fully supports your suggestion.